I woke up this morning to the sad news that (Sir) Jimmy Savile had died yesterday (the 29th of October) at the age of 84 (in fact, 2 days shy of his 85th birthday). Most people under the age of 25 or 30 will never have heard of Jimmy Saville, but to people over 30 I am sure his name means something. 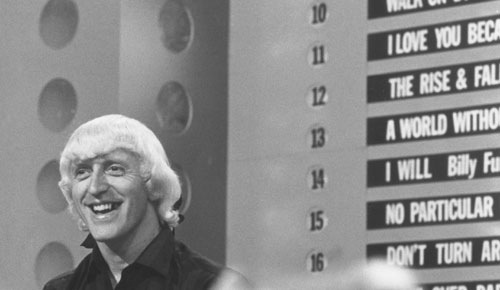 Jimmy Savile was a disc jockey, a TV presenter, and a charity fundraiser. In fact, it was for his services to charity fund raising that he was awarded his knighthood in 1990. He was the first ever presenter of Top of The Pops, which debuted on the 1st of January 1964 and was, until the 1990s, obligatory viewing for anyone wishing to follow what was going on in the pop charts in the Disunited Kingdom. In 1975 he started presenting a TV programme on Saturday evenings called “Jim’ll fix it”. This programme ran for an incredible 19 years. The idea was quite simple, children would write in to Jimmy Savile with a request for something, such as going to the Arsenal training ground to meet their football heroes, and Jim would “fix it” for them. In its time, this programme would attract well over 10 million viewers each Saturday, so combined with his DJ career, Jimmy Savile was very much a household name. What is maybe less well known is that he raised over £40 million for charity, mainly for Stoke Manderville Hospital. He also volunteered at this hospital, working as a porter, and ran many marathons to raise money for various causes. Like most celebrities, he had a few catch phrases, perhaps the best known being “now then, now then, now then” (always said 3 times). As many of his colleagues have said today, he was one of a kind. 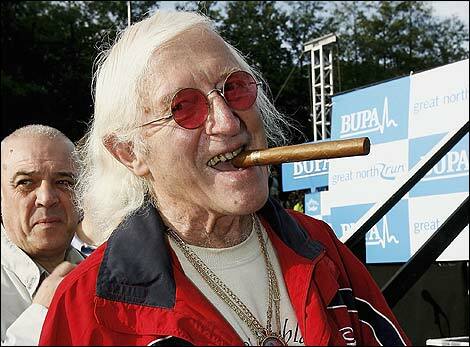 Rest in peace Jimmy Savile. On yesterday’s BBC Wales Today evening news programme there was an item about the soon to be completed Wales coast-path. It has been voted number 1 in a list of “top regions to visit in 2012” of anywhere in the World by Lonely Planet. What a fantastic achievement for Wales, to top the list of places anywhere in the World to visit. I really hope the people in charge of promoting tourism in Wales internationally capitalise on this remarkable endorsement by one of the premier travel guide companies. More details of this ambitious project, an 870-mile (1,400 km) path running along the entire coast of Wales, from Chepstow in the south to can be found here. I was lucky enough to grow up in Pembrokeshire, spending my childhood from 4 to 18 years of age in this beautiful part of the World. 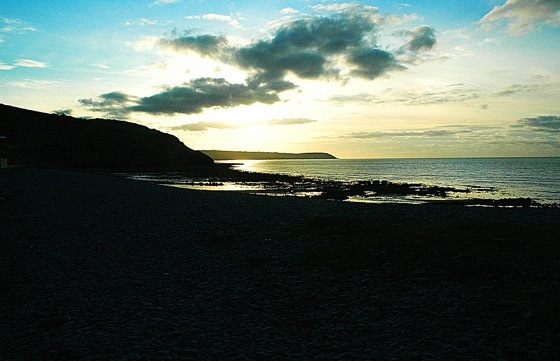 A Pembrokeshire Coast National Park was established in 1952, and is still today the only National Park in the Disunited Kingdom which is primarily coastal. 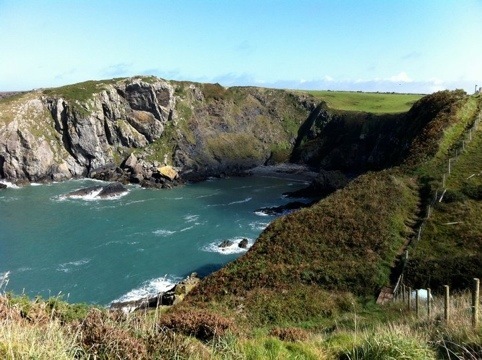 The Pembrokeshire coast path, which was officially opened in 1970, is a major attraction in Pembrokeshire. It stretches for 186 miles (300 km) from Amroth in the south of Pembrokeshire to Poppit Sands in the north of the county. Although I have never completed its entire length, I have walked many miles of it over the last 40-odd years. Last September, on a beautifully sunny Saturday, I walked a stretch of the north Pembrokeshire part of the coastal path, from Abercastell to Porthgain, to raise money for WaterAid. I have often gone running along it, which is a pretty hard workout I can tell you, and one day I plan to walk its entire length in a 3-5 days stint, something my father did back in 1963. In 2006 remember reading in the Western Mail that a coastal path had been completed around Ynys Mon (Anglesey), but I have to admit I was unaware that the Welsh Assembly Government had funded the Countryside Council for Wales to complete a coastal path around Wales’ entire 870-mile coastline. This path is now nearing completion, and so apparently Wales will become the first country in the World with a coastline where one can walk the entire length. This in itself is a wonderful achievement, which added to Lonely Planet placing Wales’ coastline path at the top of its list of places to visit in 2012 should be reason for our small country to be proud of itself. And, it is another example of the “made in Wales” phenomenon, where the Welsh Assembly Government decides to spend money on something which the London Government would probably not have considered as important. I sincerely hope that people from Wales and beyond will now take advantage of this natural attraction and discover the beauty of the Welsh coastline. I have travelled to many parts of the World, including Asia, Africa, Australia and North and Central America, as well as other parts of Europe. 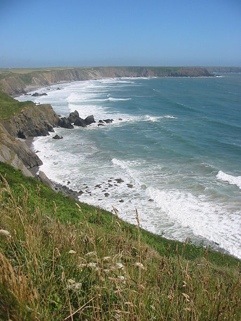 But I have never seen as beautiful a coastline as the one only 5 miles from where I grew up. Yesterday on Twitter, a friend of mine commented on how odd it was to see an advert for a sperm bank on the London underground. When I asked him why he thought this, we got into a discussion about how many male students donate sperm as a way of making a bit of extra cash at university. When I was a student at Imperial College, my flatmates and I often discussed getting £20 or £30 for doing something we were doing for nothing anyway. I honestly never got around to donating sperm, but I am sure many male students do. Later yesterday evening, my mind wandered to this wonderful episode of the US comedy series Seinfeld, called “The Contest“. This episode was the 11th episode of the 4th series, and is episode 51 of the entire Seinfeld sitcom. It was first broadcast in November 1992, by which time I was living in the US. I thus saw this episode being broadcast way back then, and to say it was groundbreaking and risqué at that time for a prime-time US sitcom would be an understatement. As this clip of highlights from this episode shows, the contest in question is to see who, of the four main characters, can go the longest without masturbating, after George has been caught “pleasuring himself” when his mother unexpectedly returns home. I have never quite understood why Seinfeld was not as popular in the Disunited Kingdom as other US comedies like Frasier or Friends. To my mind, it is far superior to both. And this episode is one of the funniest episodes of the 9 series. If you have never seen Seinfeld before, I highly recommend it. What is your favourite TV comedy? In 1997, a referendum was held in Wales to decide whether we wanted some form of self-government. It was voted in by the narrowest of margins, so since 1999 Wales has had some level of devolved government, the Welsh Assembly Government. This gives Wales its own control over certain aspects of everyday life like Education, Health, Food and Highways and Transport. In Wales we have free medical prescriptions for everyone, whereas in England it is only certain groups (e.g. the old, pregnant women, children, the jobless) who get free prescriptions. A few weeks ago Wales became the first country in the United Kingdom (or, Disunited Kingdom as I prefer to call it) to ban plastic shopping bags. Ireland banned such bags several years ago, but no country in the DUK had banned them until now. Strictly speaking, they are not banned, shops are required to charge 5p for them. Of course, most people won’t pay 5p and so are either not using a bag or, if they have too much to carry in their hands or put in their bag, they will take a reusable bag with them to the shop. Given the amount of plastic bags one finds littering the streets and countryside, I am all in favour of this move. As I am in the other differences the WAG has introduced to life in Wales compared to England, such as free prescriptions and a higher subsidy to higher education. In today’s Western Mail, there is an article analysing how successful some of the policies the WAG has introduced (which are different from England) have been. It is a pretty interesting read. I lived in the United States for 9 years. Most people in the DUK don’t realise that individual States in the US have far more autonomy from the Federal Government in Washington DC than even the Scottish have from Westminster (and Scotland have more devolved powers than Wales). When you consider that states in the US have tax raising powers, something Wales does not (yet) have, it amuses me when some people in the DUK think that the level of devolved power we do have in Wales is too much. If you live in Wales, do you think the majority of measures passed by the WAG with the “made in Wales” stamp are a good thing? If you don’t live in Wales, what would you like to see changed in your own country or state? Over the weekend my 13-year old daughter was repeatedly singing “The lights are out, but you’re not home…”, and I thought “Ooh, I recognise that song, it’s Robert Palmer’s “Addicted to Love””. When I said this to her she said no, it was Florence + the Machine. I went onto YouTube to listen to Florence + the Machine’s cover of this classic 1980s hit, and I must say I liked it quite a lot. The original, which was released by Robert Palmer in 1986, is best remembered for its iconic video, directed by legendary British photographer Terence Donavon. The most memorable aspect of the video is the red-lipsticked, pale skinned female “band members” (who were, in fact, professional models), who swayed in the background as Robert Palmer sang the song. Such images leave an indelible stamp in the mind of any heterosexual male. But, it was not just the video I liked, the song has a pretty good groove and Robert Palmer sang it really well. In general I nearly always prefer the original of a song to a cover version. I am not sure why this is. I think it is because if I get to the like the original first, it’s hard to adjust to a different version. There are a few exceptions to this, and I will talk about some of them in future blogs. Which cover version do you like more than the original? Today I have some kind of training in work. I really don’t know what to expect, but if it is an disastrous as the training day in this episode of the BBC sitcom “The Office” then it will truly be memorable. However, I am yet to come across anyone quite as bad as David Brent as a boss, so it should be OK. This Sunday morning saw the final of the Rugby World Cup, between New Zealand and France. My son needed to be in Barry by 8:30am, so I decided to go for a run along the Heritage Coast from Llanilltud Fawr (Llantwit Major – how did the name “Illtud” become “twit” to the English??). I watched the game later via the internet on ITV’s “catchup” service. My run was very different from last week’s Cardiff half marathon, where I ran with more than 12,000 others. I saw barely a soul during my 10 mile run, and only had the sound of the sea off the coast for audio company. Meanwhile, in Eden Park Auckland, 60,000 odd rugby fans were watching the New Zealand v France final unfold. France had gone into the final as heavy underdogs, having just beaten Wales 9-8 in the Semi Final match last weekend, whereas NZ had looked impressive in all their matches. To say that France raised their game for the final would be an understatement. For most of the game they were by far the better team, and it ended in an 8-7 victory for NZ. I would imagine most Kiwis had bitten their nails down to the bone in the last 15 minutes, as France were very much in the ascendency. But, NZ clung on, and so won their 2nd rugby World Cup, having won the inaugural one in 1987 against the same finalists. Closer to home, Manchester to be precise, was the scene for another sporting contest, the Manchester football derby. Manchester United have dominated English football for the last 20 years, in fact last season saw them overtake Liverpool to become the club which has won the most league titles in English football. But, a few years ago Man City were bought by an investment group from Abu Dhabi, which has led to their having basically unlimited financial resources and many World-class signings. Yesterday’s derby was at Old Trafford, Man U’s fortress where they rarely lose, and had not lost for 18 months. The final score was 1-6 to Man City. Yes, six-one to Man City! This is, apparently, Man U’s heaviest home defeat in several decades, their largest since the English Premiership came into being in 1992. Alex Ferguson, Man U’s manager, described it as an embarrassment and the worst result in his playing or coaching career. To say Man U were thrashed would be an understatement, they were annihilated. As a Chelsea fan, this is all very interesting. Unfortunately Chelsea lost too over the weekend, to QPR, but surely Man U’s confidence must be in tatters after such a defeat. With Chelsea in 3rd, only 1 point behind Man U, surely 2nd place beckons for the Blues. The weekend just shows that one can never predict sport, which is one of the reasons I find it so compelling. 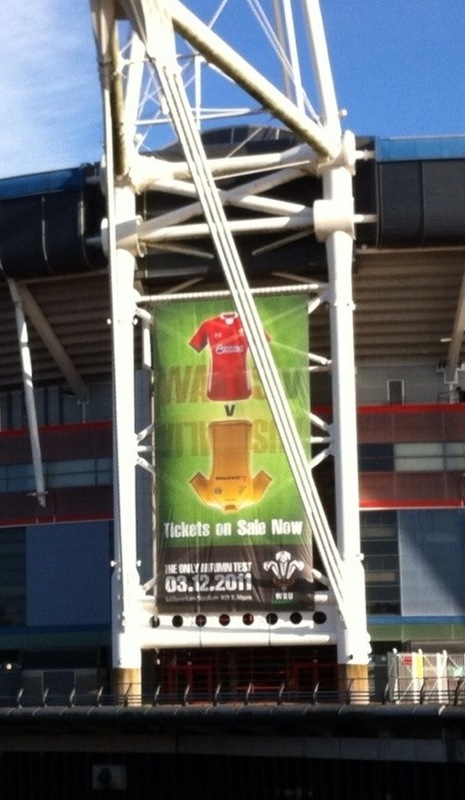 I only hope Wales manage to outscore Australia by a factor or 6 when we play them in Cardiff on the 3rd of Decemeber!